THE OLYMPIC TORCH MARTINI - Going For The Gold! Shake a few of the edible gold flakes into your martini glass. Pour the Bacardi® Torched Cherry and the Bacardi® Spiced Rum over the gold flakes. Carefully layer the Bacardi® 151 rum on top by pouring it very carefully over the back of a spoon into the martini glass. Carefully* ignite the 151 rum (a barbecue lighter is a good tool here). 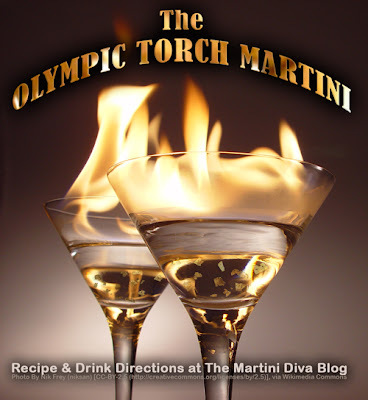 It is best to assemble the Olympic Torch Martini at the table or serving location instead of moving it once it's lit! Do NOT drink this while the cocktail is still on fire! Extinguish all flames before consumption! Cap off all liquor bottles and move away from the area before lighting any cocktail on fire. Remove any other flammable items and watch out for your clothing and hair. Do not use a delicate or crystal glass because they are more prone to shattering from the heat and flame. Use a cheaper and heavier glass instead. Keep a fire extinguisher, glass of water or some other fire suppression method at hand. Should the glass explode the flaming alcohol could run all over and start a very bad fire, remember, alcohol IS a fire accelerant! Do NOT stick any part of your body in or near the drink until you are positive the flames are extinguished. If it's too light outside you may not see the flames clearly as alcohol flames burn blue. Do not serve this to someone who has clearly had too much to drink. Do not do this in the presence of children. Don't give them any more dangerous ideas! Since I have made several versions of Chocolate Vodka and Chocolate Liqueurs, I decided it might be fun to try a Chocolate Cake Vodka. 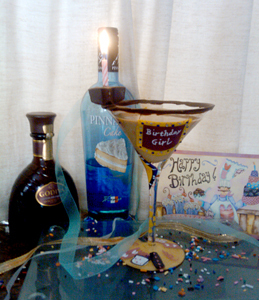 This was perfect because my birthday was coming up in a few weeks and I just had enough time for the chocolate to infuse in the booze and make myself a Chocolate Birthday Cake Martini! I started with Pinnacle Cake Vodka because it tastes and smells just like yellow cake batter so if I could get chocolate into that I was in good shape. I decided to use one of my Chocolate Candy Bar liqueur recipe techniques because they are easy and all I needed to do was add that chocolate. The Chocolate Cake Liqueur recipe and steps are below the cocktail recipe. As for the cocktail, you'll see that I had a candle attached to my martini glass. That was a simple enough procedure, I took chocolate chips, melted them in the microwave for about a minute and a half, poured a little into a plate to rim the glass and the rest into a star shaped candy mold. 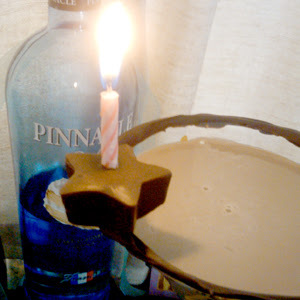 I stuck the candle into the chocolate star and let that cool in the fridge along with the rimmed glass. Then I melted a bit more chocolate and used that as the "glue" to stick the star to the glass rim! Pour your homemade Chocolate Cake Vodka, the Godiva Liqueur and the chocolate milk into a cocktail shaker filled with ice and shake until chilled. Pour into your glass, light the candle and serve. Take 12 ounces of very dark, bittersweet chocolate and chop up into small pieces with a knife. 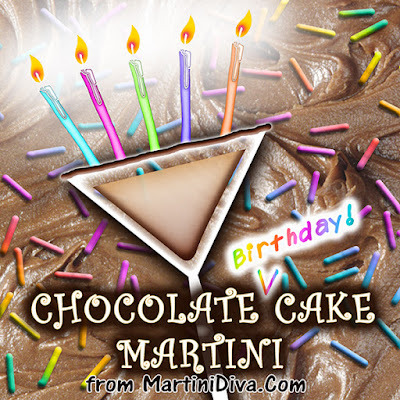 The darker and less sweet chocolate is better because Cake Vodka has enough sweetness on it's on. Put the chopped chocolate into a blender with a 750 milliliter bottle of cake vodka and rough blend this. Don't get it too blended or you'll end up with a syrup. Pour this all into a quart glass jar that has a sealable lid and place in the refrigerator for two weeks or up to a month. Shake at least once a day. When your cake vodka has absorbed enough of the chocolate flavor for you, strain it first through a large metal strainer and then, little by little, through a coffee filter lined strainer. Use a new coffee filter each time you fill the strainer and be patient as this takes time. The coffee filter is straining out all the solids which can make your liqueur grainy. Once your Chocolate Cake Liqueur is completely strained you can pour it into a decorative bottle, label it and enjoy or share!